It was very private, and quiet. The setting was stunning. Everyone was very friendly and accommodating. Conveniences nearby. Amazing view, amazing service, close to all the attractions in the town .. don’t even think twice just book it! I loved everything the environment was would and the silence is something i don't get alot. Would definitely be visting again. Lovely spot on the island that's a bit remote but still accessible. The view and location is superb if you want to see the ocean. Staff was excellent and everything is well maintained. You have everything you need in the studio. Everyday they come and tidy your room which is a nice plus. Would definitely go back next time I'm in Barbados. I absolutely loved the treehouse-esque balcony with breathtaking ocean/ mountain views,comfortable bed and easy to use appliances. I also appreciated the complimentary pre programmed cell phone to make local calls. The staff is incredibly helpful and accommodating. 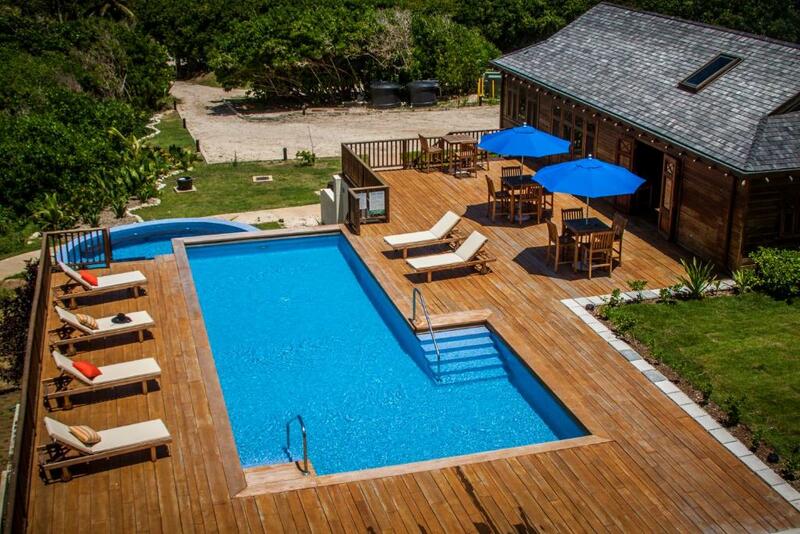 Santosha is absolutely wonderful if you are looking for a retreat on Barbados. This is not for the traveler who wants an all inclusive in Bridgetown. Instead be ready to get a sense of the "Real Barbados" as you travel across the whole of the island! Large rooms and very quiet and peaceful. Very nice staff. We very much liked the location. The apartment was spacious and clean. Staff were lovely and helpful..Although we had all our supplies with us, we thought it was a nice touch that there were basics for breakfast in the clubroom. We would certainly return. If you want a get away from it all, secluded, solitary place to stay then it might be for you. The wilder east coast is a massive contrast from the busy west coast. 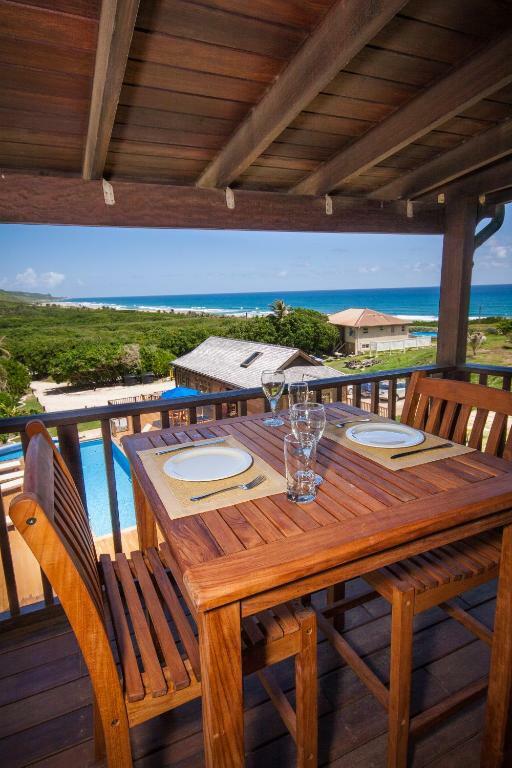 Lock in a great price for Santosha Barbados – rated 9 by recent guests! 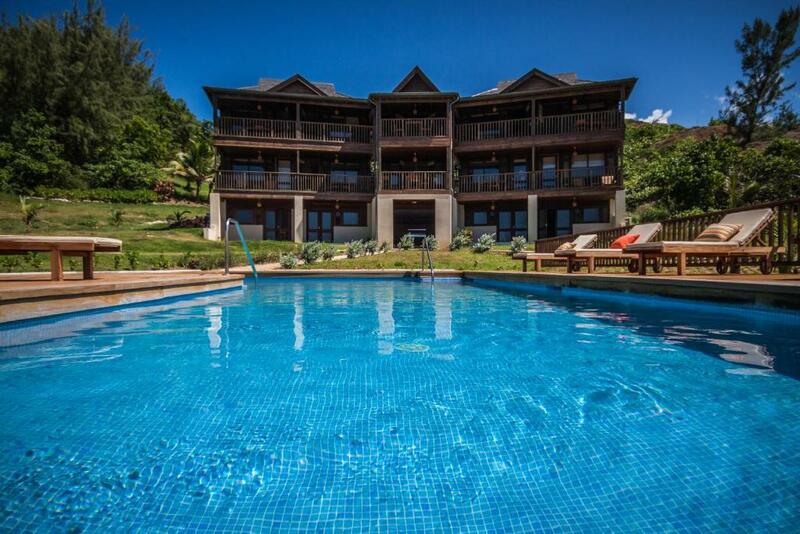 Santosha Barbados This rating is a reflection of how the property compares to the industry standard when it comes to price, facilities and services available. It's based on a self-evaluation by the property. Use this rating to help choose your stay! Santosha Barbados is located in a rural part of Barbados, 1,000 feet from Walkers Beach and 35 minutes’ drive from Grantly Adams International Airport. It features a furnished terrace with a swimming pool. The air-conditioned, self-catering accommodations include modern décor with wooden furniture, free Wi-Fi, satellite TV and a balcony with sea views. 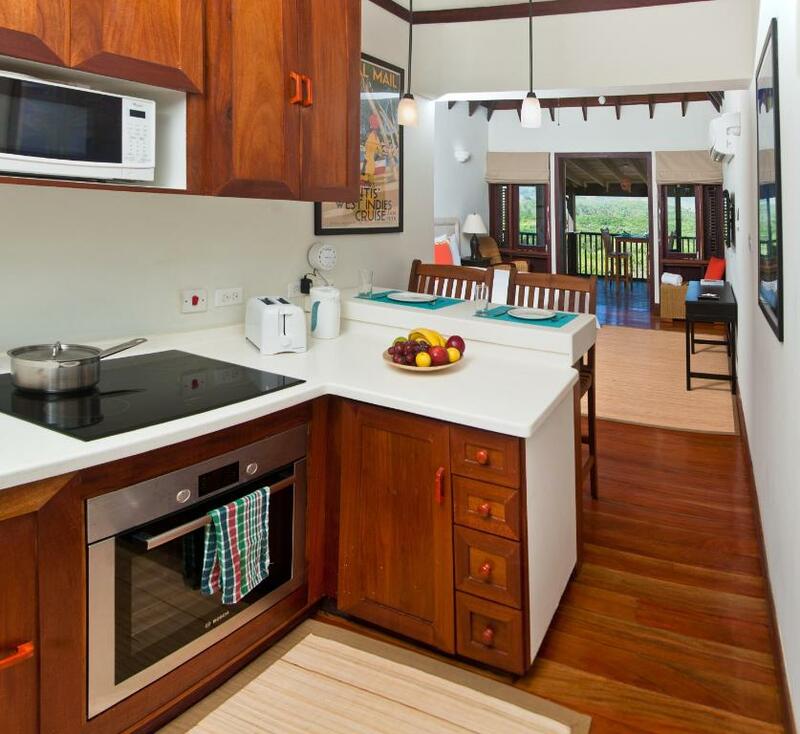 The kitchens are fully equipped and there is a bathroom with a shower. Shopping malls are located 20 minutes’ drive from Santosha Barbados. This hotel also sells grocery packages to its guests. The property is 45 minutes’ drive from Bridgetown Town Center and 8.7 mi from Royal Westmoreland Golf Course. This property also has one of the top-rated locations in Saint Andrew! Guests are happier about it compared to other properties in the area. 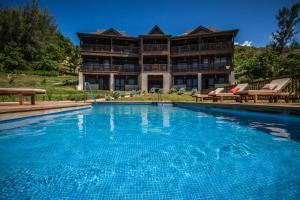 This property is also rated for the best value in Saint Andrew! Guests are getting more for their money when compared to other properties in this city. When would you like to stay at Santosha Barbados? This luxury suites features a spacious double bedroom, private bathroom, dressing room and additional wardrobe. There is a living area with a double sofa bed and a fully equipped kitchen. A generous ocean view balcony and satellite TV, air conditioning, personal safe and free Wi-Fi. This studio features a fully equipped kitchen and a spacious balcony with ocean views. It includes satellite TV, air conditioning, safety box and free Wi-Fi. This studio features a barbecue, kitchenware and air conditioning. We are self catering apartments set in a beautiful and quiet village. A perfect place to return to after adventuring to the many wonderful attractions the island has to offer. Our rooms are stocked with everything needed to make us your home away from home. My world currently revolves around my 3 children and my Santosha guests. A perfect day would be spent on the beach with a lovely Flindt picnic basket, white sand, blue skies and that beautiful Barbados blue water. Animal Flower Cave, Cherry Tree Hill, Morgan Lewis Windmill, Chalky Mount, Barbados Wildlife Reserve, St. Nicholas Abbey and Soup Bowl are all a short drive away and offer beautiful views or beautifully preserved history. 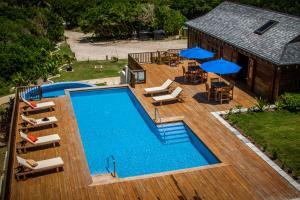 A true, rustic, rural experience of Barbados can be had in Belleplaine. House Rules Santosha Barbados takes special requests – add in the next step! Children 8 and older are allowed at this apartment. Santosha Barbados accepts these cards and reserves the right to temporarily hold an amount prior to arrival. Please note that the check-in will be done between the 15:00 and 17:00 hours. For check-ins outside that schedule, please notify the hotel in advance. Please inform Santosha Barbados of your expected arrival time in advance. You can use the Special Requests box when booking, or contact the property directly using the contact details in your confirmation. We had read many reviews and it exceeded our expectations. There’s no one around, the place is very tired and needs doing up. There’s no restaurants nearby, you have to drive 10-20 mins along bumpy windy roads in the dark to find any one of 3 reasonably restaurants. You don’t see your fellow guests at all as there is nothing communal. It has potential, but needs a major facelift, putting on a breakfast for guests would at least bring people together. We stayed for 3 nights and the hotel was never more than 1/2 full any night. No amenities near by so you need to buy groceries on the west coast. Great view and tranquil surroundings. The building and location should have provided a tranquil and peaceful week. However the building design didn’t work for us as the footfall noise from upper floors was very disturbing. Lovely apartment with lovely views in a spectacular area. Was a little surprised when we checked into the room that it was a "handicap " room. The shower had no curtain and the sink was very low. The salt water pool was okay, but needs to be cleaned more often. The BBQ Grill needs to be fixed as well. It was a quiet area with beautiful views, not a typical tourist area. Clean and comfortable room. The bet was slightly uneven, which made it difficult for me to sleep in. Great place, lovely setting on the east coast. The view is amazing, it's peaceful and quiet, very relaxing. The place is fabulous. We were first in a downstairs room and had some *very* loud children running around above us, which almost made us leave. We got moved to a different room upstairs, which was lovely and quiet, and in the end we stayed an extra night. If we'll stay again it will definitely be in an upstairs room! The most beautiful location, the view was just stunning. Very friendly and helpful staff. Loved the pool also, which was always empty for an evening swim. - (NOT a negative for me here, but as an FYI) The property is somewhat remote, so if you're looking to make the most of the party scene on the western side it's a drive to get there. Most of the guests who stay at the property aren't into that but something to note. Do note, you do need to rent a car. - The property is constructed from solid wood so sound does carry. A quick request to neighbors is required here or there should noise travel, but this isn't a big problem either. Only challenge I had was the amount of noise the persons above me started making on the final night of my stay but I don't see that as the hosts fault. It was quiet. I was able to rest with little to no interruptions. Responses to inquiries were fast and everything I needed was supplied upon arrival. I definitely got everything I was promised online and then more.